Making words out of Periodic Table elements - We've all done it (well a certain subset of us have at any rate). Its a bit like making words on your calculator - you write a couple of them ('goggles' and 'blobs' were some of the words that had us school boys tittering) and then don't take it any further. Periodicalised words are similar, you might realise you can make BaBe (out of Barium and Beryllium) or CaPuCCInO (out of Calcium, Plutonium, Carbon, Indium, and Oxygen) but how far can you take it? I had this conversation with Tony Davis at the Hay Literature Festival in 2008 on the Art Meets Matter stall, whilst buying some of their iconic Penguin mugs. He was interested in the language and vocabulary you can create and I was interested in making something that could churn this vocabulary out automatically. We chatted in dribs and drabs but starting going on this project in earnest towards the end of 2011. Fast forward to the 2012 Hay Literature Festival. 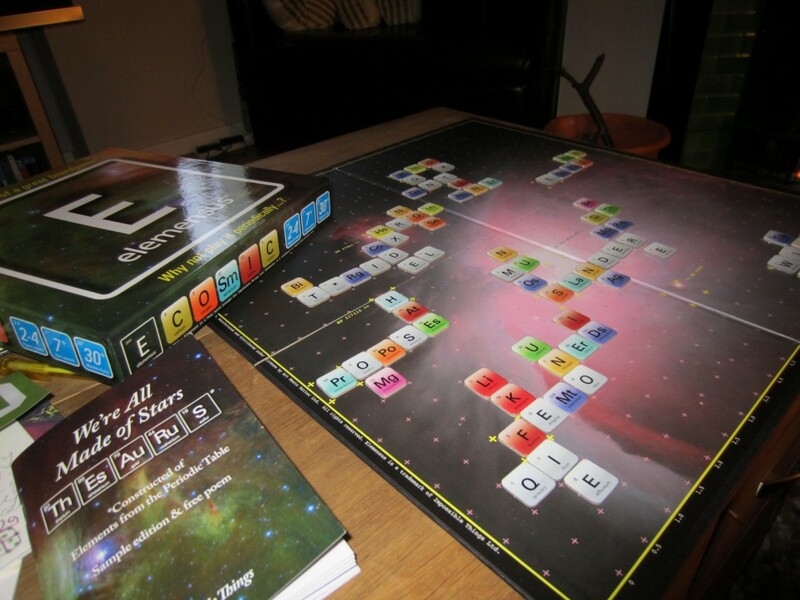 Art Meets Matter is selling a brand new, word-based, periodic table inspired board game which gives you 162 tiles with Periodic Table elements on side and A-Z letters on the other. Its called Elemensus. 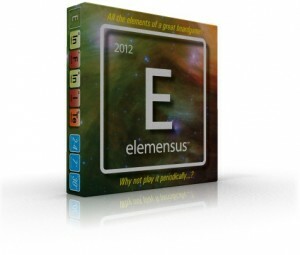 For more about how you play the game have a look at the Elemensus info page. It was quite a rush to get the board game finished in time but Tony and I were adamant we wanted it to be launched at Hay. All the graphic design work is down to Tony - he has produced a number of games previously so I knew it was in capable hands (see Penguin Bookchase). I personally think he's done an amazing job. Elemensus looks beautiful. All the phone calls, late-night coding, sourcing of astronomical images and tight production deadlines, were worth it when I saw people playing the game. Elemensus was launched on 1 June 2012. I spent the weekend of 8-9 June almost continually playing the game with the punters at the Hay Festival. It was truly amazing, rather like the feeling parents must have when their children grow, leave home and become professional scientists... I felt like a proud dad hearing people really like something that I helped create. I must have played 40 rounds of the game with different mixes of people, from 10 year olds to 70 year olds. Actually the 9-12 year olds seemed to enjoy playing much more than any other age group, which could be because instead of thinking too hard about spelling words letter by letter they were more used to constructing (and deconstructing words) phonetically. If they got a Thorium [Th] tile or Erbium [Er] tile they could effortlessly find loads of words involving the sounds 'er' or 'th'. 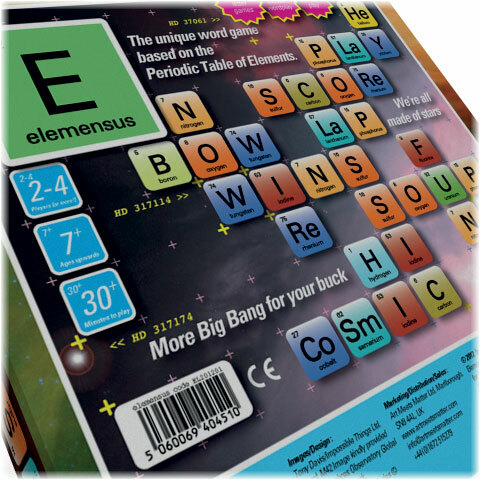 Elemensus is just the first in a longer line of products designed around the periodic table, we've called Periodic Thinking. We will be publishing a ThEsAuRuS Aug/Sept 2012 with facts, word lists and the full richness of the Periodic Thinking project. Elemensus is the flagship of Periodic Thinking and I am really proud of it.